Because QImage is a QPaintDevice subclass, QPainter can be used to draw directly onto images. When using QPainter on a QImage, the painting can be performed in another thread than the current GUI thread, that is except rendering text (because QFont is GUI dependent). To render text in another thread, the text must first be derived as a QPainterPath in the GUI thread. The QImage class supports several image formats described by the Format enum. These include monochrome, 8-bit, 32-bit and alpha-blended images which are available in all versions of Qt 4.x. In addition, QImage supports several formats that are specific to Qtopia Core. In case of a 8-bit and monchrome images , the pixel value is only an index from the image's color table. So the setPixel() function can only be used to alter the color of the pixel at the given coordinates to a predefined color from the image's color table, i.e. it can only change the pixel's index value. To alter or add a color to an image's color table, use the setColor() function. Each pixel stored in a QImage is represented by an integer. The size of the integer varies depending on the format. QImage supports several image formats described by the Format enum. The monochrome (1-bit), 8-bit and 32-bit images are available in all versions of Qt. In addition Qtopia Core also supports 2-bit, 4-bit, and 16-bit images. For more information about the Qtopia specific formats, see the documentation of the Format enum. If the image is in an indexed color format, set the color table for the image using setColorTable(). The extra const makes the entire definition read-only, which is slightly more efficient (e.g. when the code is in a shared library) and ROMable when the application is to be stored in ROM. The image depth is the number of bits used to encode a single pixel, also called bits per pixel (bpp) or bit planes of an image. The supported depths are 1, 8 and 32. 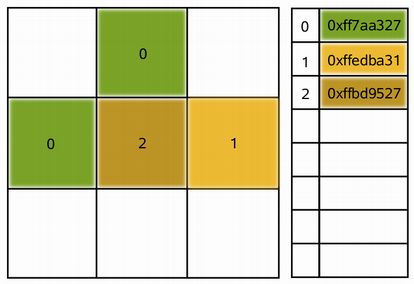 Constructs a QImage from the first size bytes of the given binary data. the loader attempts to read the image using the specified format. If the format is not specified (which is the default), the loader probes the file for a header to guess the file format. Sets the color at the given index in the color table, to the given to colorValue. The color value is an ARGB quadruplet. See also color(), setColorTable(), and Pixel Manipulation. 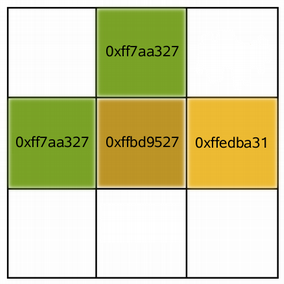 See also numColors(), colorTable(), and Image Transformations.